I love this recipe. Love, love, love. 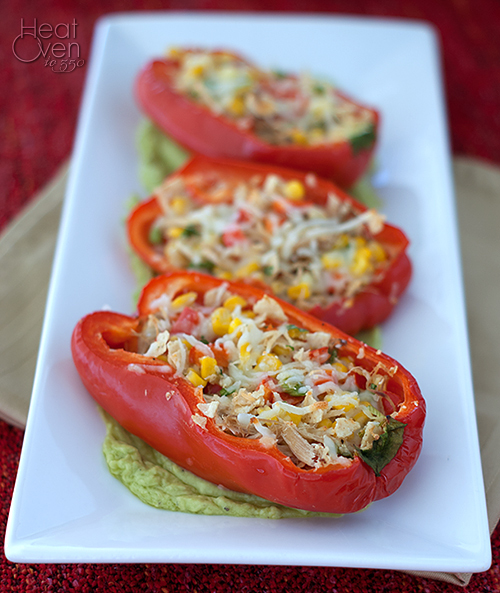 Sweet red bell peppers, chicken, corn, tortilla chips, lime, cheese and an avocado sauce. Can you blame me for being in love? Just thinking about it makes me hungry. I've made this dish over a handful of times in the past couple months, and I still look for sales on bell peppers each week in the hopes of making it again. It's just that good. There is sweetness from bell peppers and the corn, and saltiness from the tortilla chips, and general deliciousness from the cheese and lime juice. It's a stuffed pepper win all around. Let's talk for a second about the avocado sauce. Avocado. Sauce. It's not just there for its lovely green looks, although that is a definite bonus. It is rich, creamy, has a hint of lime flavor and a touch of olive oil flavor. 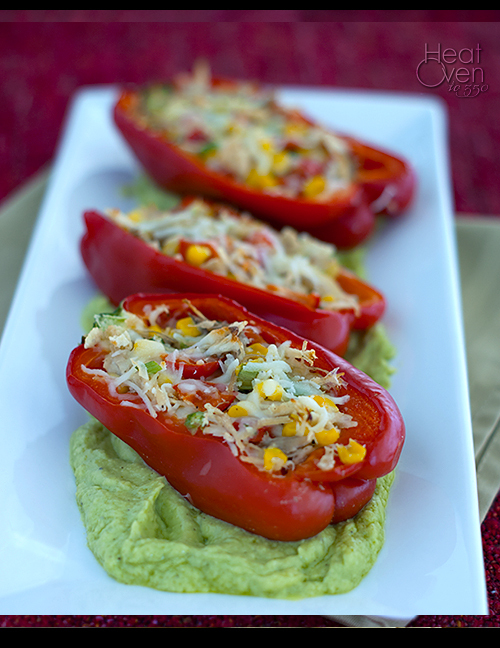 It brings a richness and depth to an already amazing stuffed bell pepper. It is well worth the few minutes it takes to blend everything together in the blender or food processor. As with many recipes that you make over and over again, I've streamlined this one to fit our tastes and make it easier. The original recipe called for roasting the bell peppers, peeling off the skin and stuffing them whole. 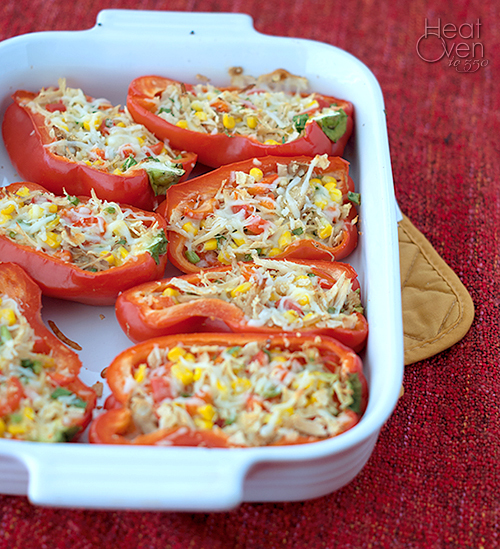 I skipped this the first time I made the bell peppers and just sliced them in half, stuffed them and called it good. While the recipe was still tasty, the peppers themselves were a little too crunchy for my taste. The second time around I went through all the trouble of roasting the peppers - and my husband didn't like them nearly as much. I thought they were easier to eat because they were softer, but I agreed that I liked them cooked less. Enter the third time around, where I used the microwave to par cook the bell pepper halves slightly before stuffing and further baking in the oven. Perfection. This is how I've been making them ever since and I love how easy it is. Learn from my experience and make life easier on yourself. The microwave is your friend. And when it comes to family dinner, so are these stuffed bell peppers. Cut bell peppers in half lengthwise and scoop out seeds. Take one half of a bell pepper and set it aside. Place the remaining seven halves in a pile with cut sides down on a microwave safe plate. Add 2-3 tablespoons water to plate and microwave until peppers are starting to soften, about 5 minutes. While peppers are cooking, heat oven to 350 degrees. Dice the reserved bell pepper half and add to a large bowl with the corn, green onions, tortilla chips, chicken, lime juice, 1/2 teaspoon kosher salt and 1/4 teaspoon black pepper and mozzarella cheese. Stir gently to combine. When peppers are softened, place in a 9x13 baking pan with the cut sides up. Add about 1/2 cup of the corn chicken mixture to each bell pepper half. Bake bell peppers until heated through, about 30 minutes. While bell peppers are cooking, combine avocados, olive oil, lime juice, 1/2 teaspoon kosher salt and 1/4 teaspoon pepper in a blender or food processor. Process or blend until smooth. To serve, add a large spoonful of sauce to a plate and top with warm bell pepper. Serve.